Summer will last 116 days. Three times as many nights will have sweltering temperatures. And there will be at least 100 more days where temperatures don't reach the freezing mark at all. Summer, in the not too distant future, will last almost four months. There will be 59 days —two months worth — above 30 C.
Three times as many nights as today will have sweltering temperatures. And there will be at least 100 more days where temperatures don't reach the freezing mark at all. This is a stark portrait of Hamilton's future under climate change, and it's spelled out in a new report called the Climate Atlas of Canada that looked at just how hot Canadian cities might become over the next 60 years. 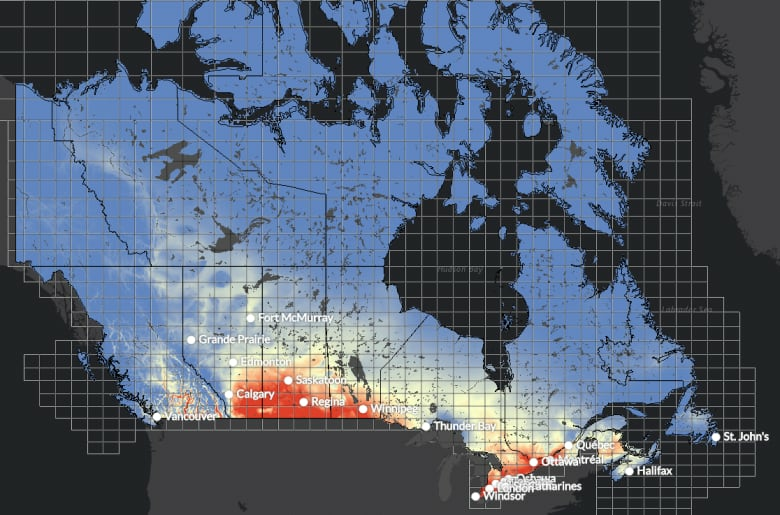 Funded by the federal government, the atlas maps out the future for Canadian cities if climate change patterns hold. In Hamilton, the weather will be hotter, wetter and more erratic. "That is the most southerly part of Canada," said Ian Mauro, co-director with the University of Winnipeg's Prairie Climate Centre, said of southern Ontario. "It is very clear when you look at heat-related maps that it is one of the quickest and most extreme warming regions of the country." Looking at the data, "intuitively, a lot of people are going to realize 'Wow, that (will) be very uncomfortable.'" Released on April 4, the atlas was funded by a grant from the Social Science and Humanities Research Council of Canada. Researchers found a similar trend across the country. By the period 2051 to 2080, Calgary will see 44 more frost-free days, and Toronto 43 more days hotter than 30 C. Right now, the hottest summer day in Montreal is typically 32.9 C. Fifty years from now, it will be 37.1 C.
Hamilton predictions are similar. In 1976 to 2005, there were 13.8 days per year hotter than 30 C. In the immediate future — 2021 to 2050 — there will be 34. Fifty years from now, there will be 59.2. The first fall frost will come nearly a month later than it did in 1976 to 2005, the atlas shows. And the annual mean temperature will be four degrees higher than it was then. Summer temperatures lasted, on average, for 69 days from the period of 1976 to 2005. In 2021 to 2050, they'll last 96.9. By 2051 to 2080, they'll last 116.1 days, or a third of the year. There's good news behind this, Mauro says. With this data, the city can start planning now how to weather the changes. Canadians can learn from hotter countries about how to retrofit buildings, generate energy, build infrastructure and grow food in this new reality, he said. Places of worship can become cooling stations in the sweltering summer heat. "I don't think we should look at these maps and be scared of them." The Stoney Creek climate activist and member of Environment Hamilton and the Hamilton 350 committee says even if all emissions stopped tomorrow, they would linger for more than a century. The atlas "underlines the urgency of the problem that we're facing," he said. And unless governments act faster, "we'll already be stuck with that and worse." The atlas numbers show Hamilton is in for some extreme heat issues, says Lynda Lukasik, executive director of Environment Hamilton. The city needs more trees downtown to increase urban canopy cover, she said. More erratic temperatures will even mean a more destabilized Niagara Escarpment. And the projected days of more than 20 mm of precipitation "really freaks me out." "We've seen areas of the city already impacted by extreme rainfall over short periods of time," she said. However the city adapts, these projections will materialize fast, Mauro said. "When you look at the mid period in the map, we're going to see that in our lifetimes." "Obviously, we have the ability to bend the curve down."